Great Value! All you need to start working out. 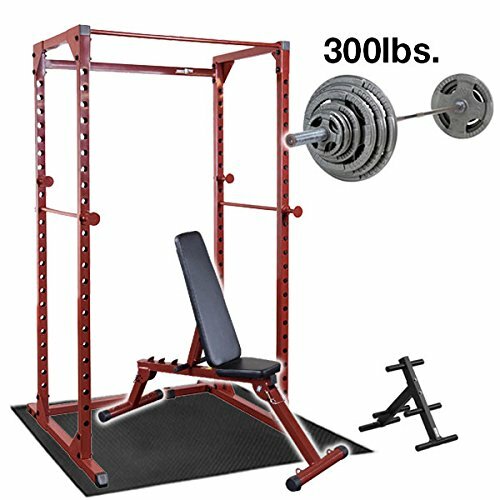 Includes: Best Fitness Power Rack BFPR100, Best Fitness Folding Bench BFFID10, 4'x6' Rubber Floor Mat RF46, Olympic Plate Tree OWT24, 300lb. Steel Grip Weight Set with Bar OST300S. The BFPR100 enables workouts safely and effectively. With the wide "walk-in" design there is plenty of side-to-side movement for a variety of exercises such as squats, incline, decline, flat and military presses as well as shrugs and calf raises. Complete with 23 positions, two heat tempered lift-offs and two saber style safety rods so you can keep your exercise routine the way it should be simple and effective. If you have any questions about this product by Best Fitness, contact us by completing and submitting the form below. If you are looking for a specif part number, please include it with your message.